A nighttime blog post by Rose asserts that a "significant redesign" of the iPod nano will spearhead a series of changes to the whole iPod line that should take place within the next two to three weeks. The fourth iteration in as many years would have the previously rumored tall screen but would resemble an unusual blend between the second-generation iPod nano and the tapered design of the MacBook Air. The skin would have aluminum at front and back but resemble a 'pinched' oval. Changing the design would require a curved transparent cover over the LCD. An accompanying but unverified photo (seen below) matches the description. Most other changes receive far less detail in Rose's rumor. The iPod touch would allegedly receive "small cosmetic changes" but would mainly be defined by the 2.1 software update, which adds background push notification for instant messaging and similar apps. The iPod would receive the update first and leave the iPhone to receive the update at an unspecified later time. No details are supplied about changes to the iPod classic and iPod shuffle, though the latter in recent weeks was rumored to get a 4GB upgrade with a modest redesign of its own. 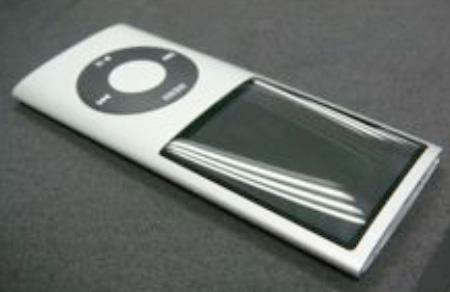 Alleged photo from Kevin Rose of a fourth-generation iPod nano. What Rose does suggest, however, is a radical restructuring of Apple's pricing strategy Apple is purportedly eager to have its iPods "get away" from the iPhone 3G's $199 price tag as much as possible and, if true, would implement "fairly large" price cuts to make the differences more apparent and prevent iPhones from cannibalizing iPod sales. While not directly supported by evidence, the rumor gains indirect support from Apple's warning to investors that an unnamed "product transition" would take place before the end of September that drops its gross margins from nearly 35 percent to 30 percent and that cost would be key. An instrumental component of these updates would be iTunes 8.0, which Rose doesn't have details on other than to hint that it would "deserve" the new revision number. For all the apparent detail, though, readers should take the report with caution. Rose's history of Apple rumors is known to wildly vary in accuracy: while he earned most of his reputation for an accurate leak of iPod nano details before its release in 2005, he has also shot wide of the mark with predictions of a CDMA iPhone and this year was convinced the 3G-capable iPhone would have a front video camera. Potentially casting doubt on this latest rumor is a claim tacked on at the end that Mac OS X 10.5.6 will add Blu-ray support to the operating system. While many have long assumed Apple's role in the Blu-ray Disc Association would eventually lead to Macs with support for the HD video medium, knowledge of the Mac OS X update roadmap beyond beta releases (currently 10.5.5) is often limited to Apple.